Companies like Freeze are taking advantage of warehouse workers’ hard work. Freeze is a private clothing company headquartered in New York City that distributes logoed sportswear and t-shirts for large national retailers, including Amazon, JC Penney, Burlington Coat Factory, Macy’s and Walmart. 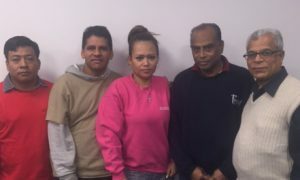 The Committee for Worker Justice at Freeze: Francisco, Tino, Liliana, Praful & Vijay. We are already fighting for a better future for our families and ourselves. If you are a customer of Disney, JC Penney, Burlington Coat Factory, or Walmart, you can help fight for decent wages for working families. Sign the petition and stay tuned for actions in New York City area. Join the call for corporations to use their managerial discretion to stop doing business with Freeze until it treats workers with dignity and pays a living wage. Major corporations who do business with Freeze include Amazon, JC Penney, Disney, Nickelodeon, Macy’s, Walmart, Family Dollar, and Burlington Coat Factory.